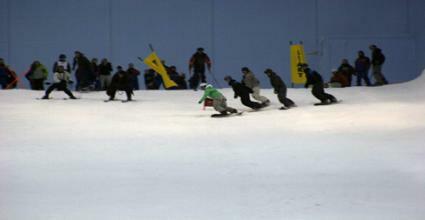 The Dubai Ski Resort is the first indoor ski area in the Middle East. The resort, which is also known as Ski Dubai, is located in the Arab Emirates. Its location in the Mall of the Emirates, which is the second largest mall in the world, makes it a viable destination for a unique ski vacation. This unusual, 22,500 square meter indoor resort is open in all seasons. In 2007, Ski Dubai was the winner of the Thea Outstanding Achievement Award. Given that most residents of the Arab countries rarely, if ever see snow, this resort was considered to be a truly innovative concept. Additionally, the resort was the collaborative effort of design companies from all parts of the world. Ski Dubai has an interesting lift ticket system. Visitors are issued Smart Cards which are swiped at what they call a ski data sensor gate. The cards are valid for two hours of skiing or snowboarding and you can recharge them for one-hour intervals. In 2009, a two-hour session cost 135 Dirhams, which is about 37 U.S. dollars. The price includes your lift ticket, ski rental, ski boot rental, ski jacket, ski pants, ski poles and locker rentals. Disposable ski socks, as well as ski helmets for children, are included. Snowboarders receive their boards and their snowboard boots. If you return the ticket at the end of the day, you will receive a refund of 10 Dirhams, which is about three U.S. dollars. However, you might want to keep the ticket as a souvenir. The Dubai Ski Resort uses a unique, indoor snow making system. The resort has two restaurants. The St Moritz Café is located in the base area and the Avalanche Cafe is located at the mid-station of the indoor hill. The resort also has a terrain park as well as a 3,000 meter snow park for kids. Temperatures are kept between 28 and 30 degrees Fahrenheit. The resort has a high-speed quad chairlift, a tow lift and magic carpets for the novice skiers. It has five trails for varying levels of proficiency and is the only indoor ski area which can boast black diamond or advanced terrain. Its longest run is 400 meters long. The Snow Park at Ski Dubai has some exciting activities for children. It features sled and toboggan runs, along with an icy body slide. These activities are perfect for kids who are not yet ready to ski. Getting used to the sensation of sliding can be a useful way to eventually prepare for the sport. The Snow Park also has a climbing tower and a snowball shooting gallery which promote the type of agility needed for snow sports. The ice cave promotes a spirit of exploration, and the 3D theater is a fun diversion. The Snow Park also has a mirror maze and a snowman-making area. The Snow Park was designed by Thinkwell Design and Production of Burbank, California. Ski Dubai is open all year long. Sunday to Wednesday: 10:00 A.M. to 11:00 P.M. Unlike many Middle Eastern countries, Dubai is considered to be a relatively safe place to visit. It is a popular vacation destination for Europeans, which gives it a cosmopolitan ambiance. The Grand Millennium Dubai is the closest hotel to the Dubai Ski Resort.